If you read these words and recognized them as your sleep patterns rather than Katy Perry song lyrics, this is probably the blog post for you. You can’t put a price on a great night’s sleep, so it is worth taking the time to figure out what is the right duvet for you. Normal sleeper: You’re low maintenance when it comes to sleeping and can probably doze off comfortably on a couch or in the car. Only on extreme days do you feel too hot or too cold during your sleep. Warm sleeper: In your current bedding, you get hot easily. Often this happens in women experiencing menopause. You’re the sleeper that’ll flail off the covers and constantly adjust the position of your limbs like the hands of a clock, trying to find a new cold spot on the sheets. You probably keep your home temperature relatively cool. Cold Sleeper: Double, no, triple layer those blankets! It’s 1am and you still can’t fall asleep because all you can think about are those tiny pockets of cold air that surround your body where there’s draft between the sheets. You likely keep your home set to a warmer temperature. Some of this sound familiar? Duvets are typically filled with one of two kinds of filling: natural (down, silk, Tencel, wool) or synthetic (microgel). Down is the layer of fine feathers embedded near the roots of larger, more rigid feathers on a bird. They come in different colors and can vary in quality depending on factors such as maturity of the bird. Duvets are usually filled with either duck down or goose down. Duck down is typically more lightweight and cooler, while goose down, being larger in size, is more insulating and used in winter weight duvets. Silk & Tencel fills, both natural fibers, are 100% hypoallergenic, which is ideal for people with sensitive skin and allergies. They are both great insulators and have natural moisture-wicking abilities that are great for warmer sleepers. 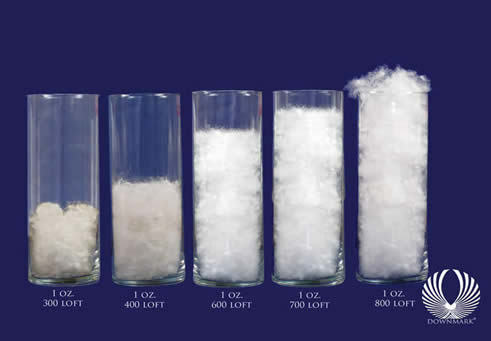 Wool fill can wick up to 1/3 of its weight in moisture while keeping your body well insulated, however it’s weight and density are suited for a more winter weight duvet. Synthetic fills that emulate down, such as microgel which is 100% polyester, provides hypoallergenic warmth and easy care for customers who want a more affordable option with great value. However, they require roughly three times the weight of down to equal in warmth, so synthetic-filled duvets are often heavier on they body. The type of fill, in conjunction with fill power, create for different weights of duvets and therefore, different levels of warmth. For non-down fills, weight and warmth is generally determined by how much fill is used. The more fill, the warmer the duvet. Things get a little trickier with down. The fill power of down translates to the volume or loft it creates; basically how fluffy and ‘poofy’ it is. 1oz of a luxury goose down can fill up more space than 1oz of a lower quality duck down, therefore it can trap more air within the duvet and create more warmth without needing more fill. For example, 32oz of white goose down with a fill power of 650 will be warmer than 38oz of duck down with a fill power of only 500! Quick tip: When buying for family, know that youngsters tend to sleep warmer so they need a more lightweight duvet! Quick tip #2: Don’t overshoot. Big fill powers, and therefore higher prices, may seem like the choice to pamper yourself with, but remember that going for an incredibly insulating duvet when you’re a warm sleeper won’t get you the good night’s sleep you’re aiming for. Consider your needs first and foremost. The ticking is the outer shell or casing of a duvet. Typically you’ll judge a duvet’s ticking by how high the thread count is. Anything above a 220 thread count is classified as being down proof (none can escape), so a higher thread count does not make a fabric more down proof. The higher the count, the softer and lighter the outer fabric will be, allowing for greater loft from the down filling and a generally softer, smoother touch. Other versions can include a Tencel shell, which provides cooling and moisture-wicking properties on top of its synthetic filling, making it perfect for the warm sleeper. When picking a duvet, the ideal and most efficient method of construction is the baffle box. Essentially, a grid of fabric walls are stitched perpendicular to the two outer surfaces of the duvet, creating interior boxes. These boxes allow space for the down to loft to its maximum extent and remain evenly distributed throughout the duvet, leaving no cold spots. Another common construction method you’ll find is the stitched box (or some variant of it), where the grid is stitched directly through both layers of ticking. With this method, the down can be uneven and cold spots can occur along the sew lines where down is scarce and compressed. However, your duvet will have a more sculpted look and perhaps, some cool spots may be an advantage to you. Don’t forget to take into consideration the other layers of fabric you choose to include on your bed. If you’re someone who likes to sleep with an added coverlet, flat sheets, or even a thicker, jacquard duvet cover, these are all added layers of fabric that will increase the warmth and weight of your bedding. If you’re a warm sleeper, choosing an all-season duvet and then adding a jacquard cover could be too hot for you. Quick tip: To increase the longevity and effectiveness of your down duvet, avoid weighing it down with heavy layers on top or by constantly sitting/laying on top of your covers. This compresses the down, reducing its ability to loft over time. NOW YOU’RE A DUVET EXPERT! Overall, it is about your comfort and catering to your budget as well as your needs. A good duvet is a worthwhile investment that can last up to 20 years, so take the time to understand what you’re getting.